When we think of salads, we typically envision fresh beds of leafy greens. Kale, arugula, romaine, iceberg…But let’s not forget our other beloved salads like pasta salad and potato salad. These favorites are always a hit at summer gatherings. They’re incredibly easy to make and you can prepare them hours in advance without worrying about ingredients (like lettuce) getting soggy. Many actually taste better when they’ve had time to soak up all the flavors. Plus, they’re delicious for snacking on between rounds of lawn games. So we took a look at some classic recipes and turned them on their heads. We enhanced and softened flavors, added and subtracted ingredients until a harmonious melody was created. Come savor these delectable notes with us. We traded in the creamy base of traditional potato salad for a tangier, slightly sweeter foundation. We also added a few ingredients to further develop the texture. White vinegar and our Dijon Mustard contrast beautifully with crunchy-sweet onions and gherkin pickles. Dark strips of our Black Forest Ham and crispy slices of bacon add a savory twist. For a pop of green and earthy flavor, we incorporated steamed asparagus and diced celery ribs. 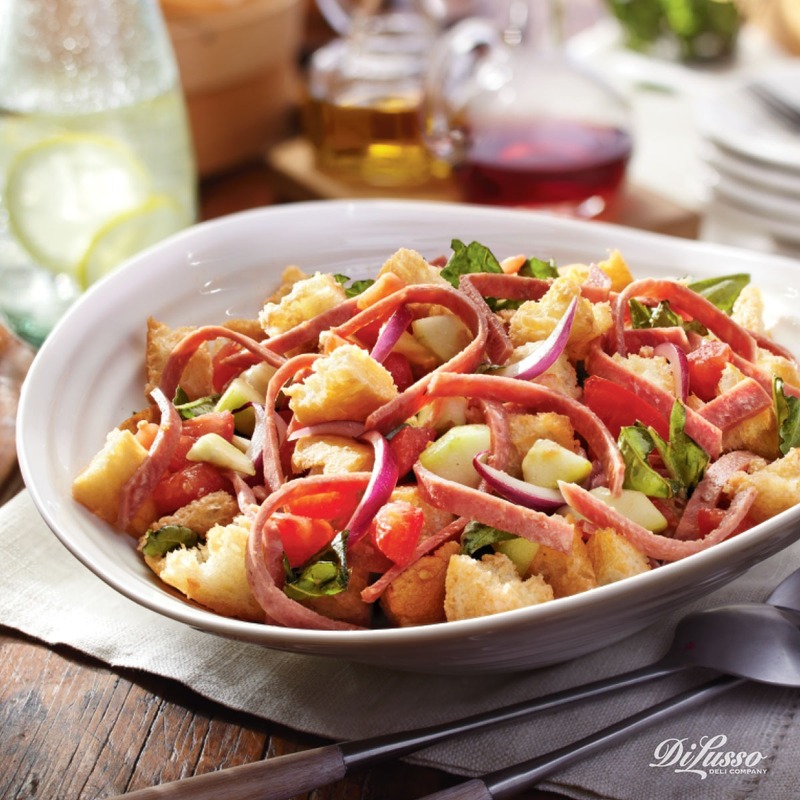 Also known as Panzanella, bread salad is a traditional Italian dish that’s incredibly easy to toss together. Ours beautifully blends flavors and textures that at first blush might seem discordant – tart balsamic vinegar, our peppery Genoa Salami, juicy tomatoes, sweet red onions, aromatic basil. Plus, it’s a perfect way to use up bread that’s getting stale. Don’t have any stale bread on hand? Just toast bread cubes in the oven for about 15 minutes, or until slightly crispy. We’d suggest staying away from anything too crunchy, like croutons, to make sure all the delicious flavors can mingle and mix within the bread’s porous pockets. You won’t find any farfalle (bow tie) or rotini in this pasta salad. Nor penne or shells. 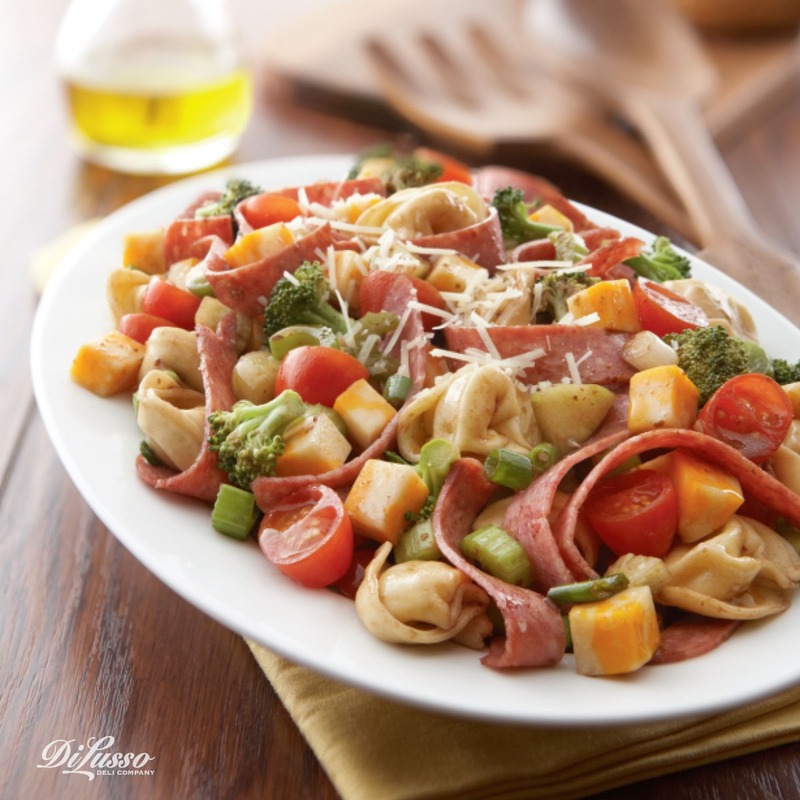 What you will find is rich cheese tortellini tossed in a zesty yet slightly smoky dressing made from ingredients like balsamic vinegar, our Dijon Mustard and Worcestershire sauce. 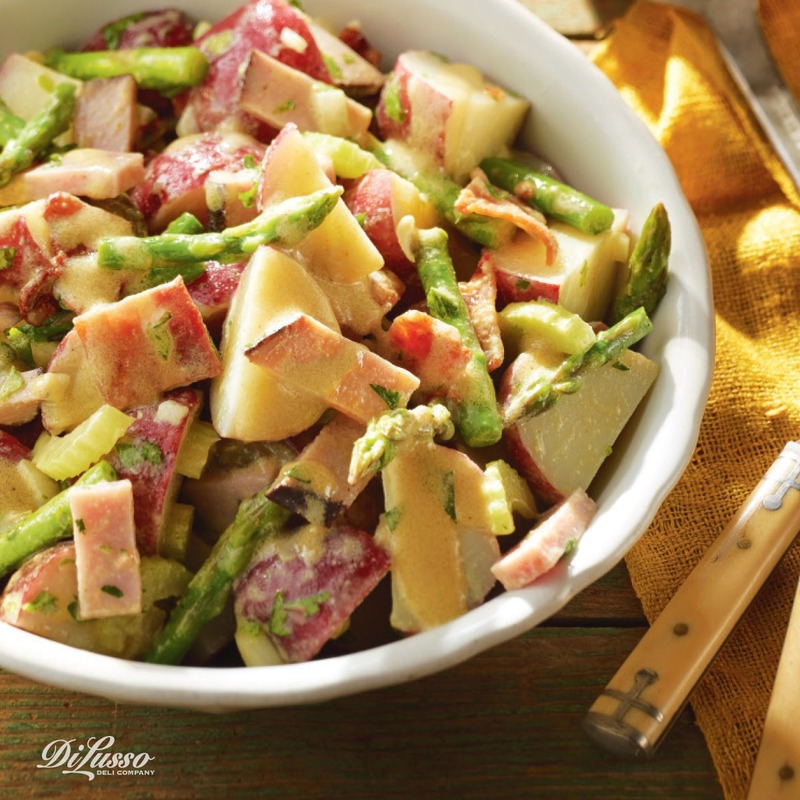 Our Honey Roasted Ham, green onions and grape tomatoes add notes of sweet, while celery, cucumber and broccoli florets contribute a refreshing crunch. Top it off with our diced Colby Jack Cheese and fresh Italian parsley, and you’ve got a full-bodied pasta salad on your hands.